Northeastern Minnesota is rapidly becoming a golf destination. The Wilderness, the Quarry, and the Legend are all Championship courses within one hour of Pehrson Lodge. We are also fortunate to have a number of very nice nine hole courses in the area. Vermilion Fairways is one of the nicest courses in the area and it is located just one mile from Pehrson Lodge. 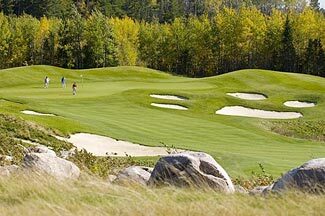 Lake Vermilion Golf Courses GOLF THE "WILD NORTH"
"The Legend" and "The Quarry"